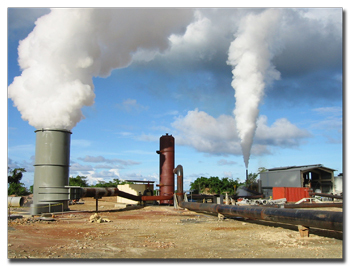 For those geothermal resources with a temperature generally above 190ºC, a single-flash type of plant is often the best economic choice. Higher temperature reservoirs will typically produce both water and steam under natural pressure. This two-phase flow is usually directed to a separator that allows the steam fraction to be piped to the plant and the water fraction to be piped back into the reservoir via injection wells. The steam entering the plant is often run through a demister to eliminate any entrained droplets of moisture. A small portion of the steam is directed to a steam jet ejector system and the balance is directed to the turbine. The ejector system generates a very low vacuum at the turbine exit, maximizing the mechanical energy produced by the turbine. Steam exiting the turbine is directed to a condenser operating at the low vacuum. Water from a cooling tower is typically sprayed inside the condenser, condensing the steam back into water. This water is then pumped to the top of the cooling tower for heat rejection to the atmosphere.